VINTAGE COSTUME ANTIQUE ESTATE JEWELRY BROOCHES AND PINS! Signed Coro White Seed Pearl Goldtone Vintage Antique Estate Flower Brooch Pin For Weddings, Proms, Pageants And Parties! 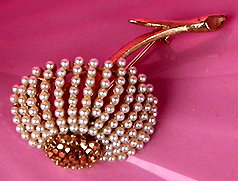 Item #P168278 - Signed Coro White Seed Pearl Goldtone Vintage Antique Estate Flower Brooch Pin. This signed Coro beautiful designer flower brooch has been expertly crafted in lustrous white seed pearls and the articulated branches are done in a florentine gold finish. The flower has a pin-cushion-like gold center that gives the illusion of sparkling gold rhinestones! Very well made and in near mint condition for lasting enjoyment. 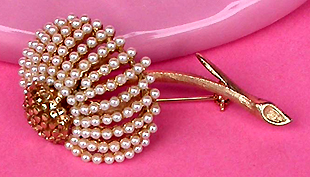 Fabulous brooch pin to wear at weddings, prom nights, pageants, parties and special functions! Price US$138.00.